Blood glucose level, also known as blood sugar concentration, is the content of glucose or sugar presenting in a human or animal' blood. Glucose provides the main source of energy for the body's cells and blood lipids remains the primary compact energy store in the form of fats and oils. Transported from the liver or intestines to body cells by the way of bloodstream, glucose is also available for cell absorption through the hormone insulin in the pancreas. Clinical research suggested that blood glucose levels that outside the normal range might be an indicator for medical conditions, and persistent high levels are described as hyperglycemia; low levels are described as hypoglycemia., It has been inferred that hyperglycemia causes a variety of long-term health problems, such as heart disease, kidney, eyes, and nerve damage, whereas the symptoms for hypoglycemia included pale complexion, sweating, irritability, lethargy, paranoid, or aggressive mentality, impaired mental functioning, and loss of consciousness, etc., There are also some causes that may lead to the fluctuation of blood glucose level, such as climatic factors, cold, insufficient dosage of drugs, long-term constipation, excessive intake of high fat food, and sudden change of work and live environment., DM is the most prevalent disease associated with the failure of blood sugar regulation, which is featured by persistent hyperglycemia. 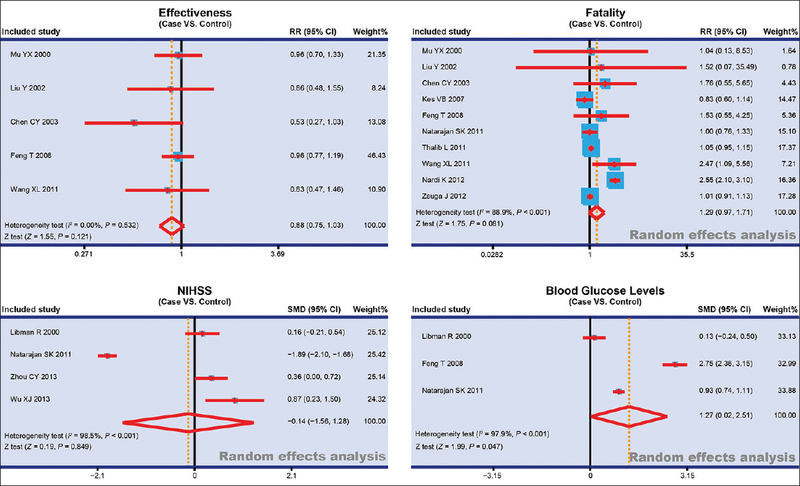 In view of above findings, there are scholars supported that blood glucose level had impact on the prognosis of patients with DM complicated with ischemic stroke., However, some findings were not consistent with aforementioned opinions., Consequently, the current meta-analysis based on the previous studies aimed to explore the influence of DM on the prognosis of patients with ischemic stroke. With the application of computerized databases (PubMed, Web of Science, China BioMedicine, Cochrane Library, and China National Knowledge Infrastructure) updated in September 1, 2014, those published papers assessing the influence of DM on the prognosis of patients with ischemic stroke were obtained, utilizing selected common keywords related to blood glucose level, and DM as well as ischemic stroke. The keywords utilized in our initial literature search were (“ischemic stroke” or “cerebral ischemic stroke” or “ischemic cerebral apoplexy”) and (“diabetes mellitus” or “diabetes” or “diabetic”) and (“blood sugar level” or “blood sugar levels” or “blood glucose level” or “blood glucose levels”). Manual research was also conducted to identify the potential relevant papers. The inclusion criteria were (1) case-control studies about the influence of DM on the prognosis of patients with ischemic stroke; (2) patients diagnosed with DM complicated with ischemic stroke were in the case group, whereas patients with ischemic stroke were in the control group; (3) included studies had to provide complete data; and (4) included studies were either in Chinese or in English. Meanwhile, the studies which were latest or complete were included when published by the same authors. However, the studies with incomplete data, large differences of baseline characteristics of the patients between the case group and the control group and repeated publication were excluded. We used a predefined reporting form to extract data from each enrolled study by two researchers independently, and collected the following information: the first author, publication time, country, ethnicity, language, disease, age, gender, detection method, study design, interventions, outcomes, etc., Disagreement on any problems was settled by discussion, or a third investigator was consulted. Two authors conducted quality assessment based on the critical appraisal skill program (CASP) criteria to assess the studies independently (http://www.casp-uk.net/). The CASP criteria are scored based on these aspects: whether the research problem is clear and definite (CASP01); whether the research problem is appropriate and whether the research design answers the research problem (CASP02); whether the selective mode is suitable for population in case study (CASP03); whether the selective mode is suitable for population in control study (CASP04); whether the measurement for exposure factors is accurate to reduce the bias (CASP05); whether the study controls other important confounding factors (CASP06); whether the research result is complete (CASP07); whether the research result is precise (CASP08); whether the research result is reliable (CASP09); whether the research result is applicable to the crowd (CASP10); and whether the research result is consistent with other evidence (CASP11). All the analyses of this present meta-analysis were conducted with the STATA statistical software, version 12.0 (Stata Corp., College Station, TX, USA). A fixed-effects model or random-effects model was adopted for computing the risk ratio (RR), the summary standard mean difference (SMD) and 95% confidence interval (95%CI), and thereby evaluate the difference between the case group and the control group with the utilization of Z-test. Cochran's Q-statistic and I2 tests were also used to quantify heterogeneity among studies., Random-effects model was applied for the evidence of significant heterogeneity (P< 0.05 or I2 > 50%), whereas fixed-effects model was applied with the absence of statistical heterogeneity (P > 0.05 or I2< 50%). Meanwhile, if there was significant heterogeneity, subgroup analyses were performed to find potential explanatory variables. In addition, a sensitivity analysis was employed to evaluate whether the removing of one single study would have impact on the overall estimate. The funnel plot and Egger's linear regression test were utilized to assess the publication bias of included studies. Our present meta-analysis initially extracted 253 studies through electronic database searching and manual search, followed by removing 72 duplicates, 39 letters, reviews or meta-analysis, 41 nonhuman studies, and 44 studies unrelated to research topics, the left 57 studies were reviewed and another 41 studies were removed with 11 studies were not case-control study, 13 irrelevant to blood glucose level, or 17 irrelevant to DM. After the left 16 studies being further reviewed, 13 studies were enrolled in the final analysis, after remove 3 studies for insufficient information.,,,,,,,,,,,, Among these 13 studies, 8 studies were performed in Asian populations and 5 studies were in Caucasian populations, including a combined total of 8463 patients (3249 patients with DM complicated with ischemic stroke and 5214 patients with ischemic stroke), which were published between 2000 and 2013. The countries where the studies performed were the USA (n = 2), China (n = 7), and one study each in Croatia, Kuwait, Italy and Hungary. The baseline characteristics and CASP quality evaluation of the extracted studies were displayed in [Table 1] and [Figure 1]. The blood glucose level at 48 h after stroke, effectiveness, fatality, and the National Institutes of Health Stroke Scale (NIHSS) Score between patients with DM complicated with ischemic stroke and patients with ischemic stroke were reported in 3, 5, 10, and 4 studies, respectively. In viewing of existing heterogeneity (I2 > 50%, P < 0.05), random-effects model was applied to pool the data of blood glucose level at 48 h after stroke, fatality, and NIHSS Score. However, fixed-effects model was utilized in effectiveness due to no heterogeneity (I2< 50%, P > 0.05). As shown in [Figure 2], the results implied that the blood glucose level at 48 h after stroke in patients with DM complicated with ischemic stroke was significantly higher when compared to that in patients with ischemic stroke (SMD = 1.27, 95% CI = 0.02–2.51, P = 0.047). However, the effectiveness, fatality, and NIHSS score in patients with DM complicated with ischemic stroke, and patients with ischemic stroke had no significant difference (effectiveness: RR = 0.88, 95% CI = 0.75–1.03, P = 0.121; fatality: RR = 1.29, 95% CI = 0.97–1.71, P = 0.081; NIHSS score: SMD = −0.14, 95% CI = −1.56–1.28, P = 0.849). A further ethnicity-stratified analysis was conducted. The fatality in patients with DM complicated with ischemic stroke and patients with ischemic stroke had no statistical significance (Asians: RR = 1.18, 95% CI = 0.92–1.51, P = 0.198; Caucasians: RR = 1.22, 95% CI = 0.73–2.02, P = 0.447). Meanwhile, NIHSS score of patients with DM complicated with ischemic stroke in Asians was obviously higher when compared to that of patients with ischemic stroke, and there was significant difference (SMD = 0.54, 95% CI = 0.07–1.02, P = 0.025); whereas there was no significant difference in Caucasians (SMD = −0.87, 95% CI = −2.89–1.15, P = 0.398). The results of subgroup analysis of blood glucose levels at 48 h after stroke based on ethnicity revealed that the blood glucose levels at 48 h after stroke of patients with DM complicated with ischemic stroke were significantly higher than those in patients with ischemic stroke (SMD = 2.75, 95% CI = 2.36–3.15, P < 0.001); whereas for the blood glucose levels at 48 h after stroke of patients in Caucasians, no significant difference was found between patients with DM complicated with ischemic stroke and patients with ischemic stroke (SMD = 0.54, 95% CI = −0.2–1.33, P = 0.172) [Figure 3]. Sensitivity analysis was applied in our meta-analysis, and the removal of any single study had minimal impact on the findings of this meta-analysis, indicating the stability of our analysis. The sensitivity analysis results suggested that all included studies had no obvious effect on merging effect value RR and SMD. The graphical funnel plots presented symmetrical, suggesting there was no publication bias. The Egger's linear regression analysis further confirmed the absence of publication bias (all P > 0.05). We also implemented subgroup analysis in consideration of other factors such as ethnicity to explore the influence of DM on the prognosis of patients with ischemic stroke. An ethnicity-stratified analysis results have indicated that there was no statistical significance for the fatality in patients with DM complicated with ischemic stroke and patients with ischemic stroke. In addition, NIHSS Score of patients with DM complicated with ischemic stroke in Asian populations was obviously higher when compared to that of patients with ischemic stroke, and there was significant difference whereas no significant difference was found in Caucasians. All these findings implied that the ethnicity factor may not be the heterogeneity source to impact the results. Some specific limitations were also acknowledged for careful consideration. First, there existed data missing of age and gender in some enrolled studies, which may affect the overall results. 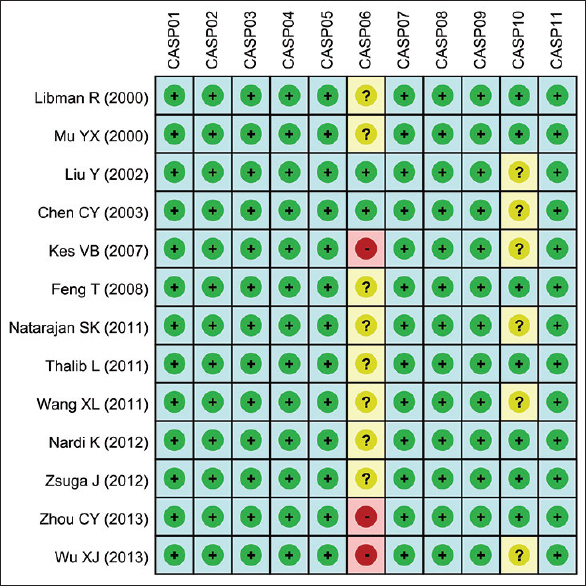 Another major concern may be the selective publication bias, for the screened references of papers only published in English and Chinese, while the studies in other languages were not included. Third, diabetes is one of the risk factors of ischemic stroke, and the reasons of hyperglycemia in ischemic stroke were stress hyperglycemia and diabetic hyperglycemia. Fasting blood glucose and elevated random blood glucose may be caused by stress hyperglycemia, and HgbA1C, as a common indicator for the diagnosis of diabetes, reflects the whole blood glucose level for the inspected person, which helps to establish the diagnosis of DM complicated with ischemic stroke. However, we cannot carry out further analysis on this aspect because of limited information in these included studies, which might result in slight deviation for our study. Last, the research methods were not unified, which may lead to some minor differences for the results in this meta-analysis. The current evidence suggests that there is statistical difference of the blood glucose level at 48 h after stroke between patients with DM complicated with ischemic stroke and patients with ischemic stroke, but there is no statistical difference of prognostic indicators between patients in two groups. Thus, our study provides certain clinical value. American Diabetes Association. Diagnosis and classification of diabetes mellitus. Diabetes Care 2014;37 Suppl 1:S81-90. Brunner EJ, Kivimäki M. Epidemiology: Work-related stress and the risk of type 2 diabetes mellitus. Nat Rev Endocrinol 2013;9:449-50. Volarevic V, Arsenijevic N, Lukic ML, Stojkovic M. Concise review: Mesenchymal stem cell treatment of the complications of diabetes mellitus. Stem Cells 2011;29:5-10. Folli F, Corradi D, Fanti P, Davalli A, Paez A, Giaccari A, et al. The role of oxidative stress in the pathogenesis of type 2 diabetes mellitus micro- and macrovascular complications: avenues for a mechanistic-based therapeutic approach. Curr Diabetes Rev 2011;7:313-24. Furie KL, Kasner SE, Adams RJ, Albers GW, Bush RL, Fagan SC, et al. Guidelines for the prevention of stroke in patients with stroke or transient ischemic attack: A guideline for healthcare professionals from the American Heart Association/American Stroke Association. Stroke 2011;42:227-76. Smith WS, Sung G, Saver J, Budzik R, Duckwiler G, Liebeskind DS, et al. Mechanical thrombectomy for acute ischemic stroke: Final results of the Multi MERCI trial. Stroke 2008;39:1205-12. Basharat Z, Mumtaz S, Rashid F, Rashid S, Mallam SA, Diljan A, et al. Prevalence of risk factors of ischemic stroke in a local Pakistani population. High-density lipoproteins, an emerging risk factor. Neurosciences (Riyadh) 2012;17:357-62. Ho JH, Tseng TC, Ma WH, Ong WK, Chen YF, Chen MH, et al. Multiple intravenous transplantations of mesenchymal stem cells effectively restore long-term blood glucose homeostasis by hepatic engraftment and ß-cell differentiation in streptozocin-induced diabetic mice. Cell Transplant 2012;21:997-1009. Gailliot MT, Baumeister RF, DeWall CN, Maner JK, Plant EA, Tice DM, et al. Self-control relies on glucose as a limited energy source: Willpower is more than a metaphor. J Pers Soc Psychol 2007;92:325-36. Gailliot MT, Baumeister RF. The physiology of willpower: Linking blood glucose to self-control. Pers Soc Psychol Rev 2007;11:303-27. Ceriello A, Novials A, Ortega E, La Sala L, Pujadas G, Testa R, et al. Evidence that hyperglycemia after recovery from hypoglycemia worsens endothelial function and increases oxidative stress and inflammation in healthy control subjects and subjects with type 1 diabetes. Diabetes 2012;61:2993-7. Ceriello A, Novials A, Ortega E, Canivell S, La Sala L, Pujadas G, et al. Glucagon-like peptide 1 reduces endothelial dysfunction, inflammation, and oxidative stress induced by both hyperglycemia and hypoglycemia in type 1 diabetes. Diabetes Care 2013;36:2346-50. Fidler C, Elmelund Christensen T, Gillard S. Hypoglycemia: An overview of fear of hypoglycemia, quality-of-life, and impact on costs. J Med Econ 2011;14:646-55. Kisiel M, Marsons L. Recognizing and responding to hyperglycaemic emergencies. Br J Nurs 2009;18:1094-8. Wang XT, Dvorak RD. Sweet future: Fluctuating blood glucose levels affect future discounting. Psychol Sci 2010;21:183-8. Inzucchi SE, Bergenstal RM, Buse JB, Diamant M, Ferrannini E, Nauck M, et al. Management of hyperglycemia in type 2 diabetes: A patient-centered approach: position statement of the American Diabetes Association (ADA) and the European Association for the Study of Diabetes (EASD). Diabetes Care 2012;35:1364-79. Takahara M, Shiraiwa T, Kaneto H, Katakami N, Matsuoka TA, Shimomura I. Efficacy of sitagliptin on blood glucose fluctuation in Japanese type 2 diabetic patients with basal-supported oral therapy. Endocr J 2012;59:1131-6. Torimoto K, Okada Y, Mori H, Tanaka Y. Relationship between fluctuations in glucose levels measured by continuous glucose monitoring and vascular endothelial dysfunction in type 2 diabetes mellitus. Cardiovasc Diabetol 2013;12:1. Zhang H, Wei J, Xue R, Wu JD, Zhao W, Wang ZZ, et al. Berberine lowers blood glucose in type 2 diabetes mellitus patients through increasing insulin receptor expression. Metabolism 2010;59:285-92. Jackson D, White IR, Riley RD. Quantifying the impact of between-study heterogeneity in multivariate meta-analyses. Stat Med 2012;31:3805-20. Peters JL, Sutton AJ, Jones DR, Abrams KR, Rushton L. Comparison of two methods to detect publication bias in meta-analysis. JAMA 2006;295:676-80. Zintzaras E, Ioannidis JP. Heterogeneity testing in meta-analysis of genome searches. Genet Epidemiol 2005;28:123-37. Zintzaras E, Ioannidis JP. HEGESMA: Genome search meta-analysis and heterogeneity testing. Bioinformatics 2005;21:3672-3. Libman R, Bhatnagar R, Ding L, Kwiatkowski T, Barr W. Placebo treatment in acute stroke trials: Benefit or harm to patients? Stroke 2000;31:355-7. MO YX. Relationship between early blood glucose in 161 patients with acute ischemic stroke and its prognosis. J Youjiang Med Coll Natl 2000;551-551. Liu Y, Lei HX. Relationship between blood glucose level in patients with acute ischemic stroke and its prognosis. Fujian Med J 2002;24:26-7. Cheng CY, Wang Q, Li XY. Influence of high blood glucose level in acute stroke. Hebei Med J 2003;25:418-9. Kes VB, Solter VV, Supanc V, Demarin V. Impact of hyperglycemia on ischemic stroke mortality in diabetic and non-diabetic patients. Ann Saudi Med 2007;27:352-5. Feng T, Dai YP, Jin M, Cao L. An exploration in the relationship between acute cerebral infarction and glycosylated hemoglobin, glycosylated serum protein. J Apoplexy Nerv Dis 2008;25:57-9. Wu XJ, Ruan YS, Fang YH, Cao Q. Prospective study on the prophase prognosis of acute brain ischemic stroke in diabetes mellitus. Anhui Med J 2011;32:738-40. Wang XL, Liang YY, Liu HW, Gao HY. Study the value of glycosylated hemoglobin and 2 hours postprandial blood glucose in patients with ischemic stroke. Hebei Med 2011;17:610-1. Natarajan SK, Dandona P, Karmon Y, Yoo AJ, Kalia JS, Hao Q, et al. Prediction of adverse outcomes by blood glucose level after endovascular therapy for acute ischemic stroke. J Neurosurg 2011;114:1785-99. Thalib L, Zubaid M, Rashed W, Suwaidi JA, Almahmeed W, Alozairi E, et al. Impact of diabetic status on the hyperglycemia-induced adverse risk of short term outcomes in hospitalized patients with acute coronary syndromes in the Middle East: Findings from the Gulf registry of Acute Coronary Events (Gulf RACE). Clin Med Res 2011;9:32-7. Nardi K, Milia P, Eusebi P, Paciaroni M, Caso V, Agnelli G. Predictive value of admission blood glucose level on short-term mortality in acute cerebral ischemia. J Diabetes Complications 2012;26:70-6. Zsuga J, Gesztelyi R, Kemeny-Beke A, Fekete K, Mihalka L, Adrienn SM, et al. Different effect of hyperglycemia on stroke outcome in non-diabetic and diabetic patients – A cohort study. Neurol Res 2012;34:72-9. Zhou CY, Liu P, Wang YF, Yin WY, Zhu ZG, Zou CL, et al. Influence of dysglycemia on the prognosis of patients wth ischemic stroke. J Med Res 2013;42:98-100. Jia Q, Zhao X, Wang C, Wang Y, Yan Y, Li H, et al. Diabetes and poor outcomes within 6 months after acute ischemic stroke: The China National Stroke Registry. Stroke 2011;42:2758-62. Ormstad H, Aass HC, Amthor KF, Lund-Sørensen N, Sandvik L. Serum levels of cytokines, glucose, and hemoglobin as possible predictors of poststroke depression, and association with poststroke fatigue. Int J Neurosci 2012;122:682-90. Kruyt ND, van Westerloo DJ, DeVries JH. Stress-induced hyperglycemia in healthy bungee jumpers without diabetes due to decreased pancreatic ß-cell function and increased insulin resistance. Diabetes Technol Ther 2012;14:311-4. Yu KH, Hong KS, Lee BC, Oh MS, Cho YJ, Koo JS, et al. Comparison of 90-day case-fatality after ischemic stroke between two different stroke outcome registries using propensity score matching analysis. Acta Neurol Scand 2011;123:325-31. Chen RL, Balami JS, Esiri MM, Chen LK, Buchan AM. 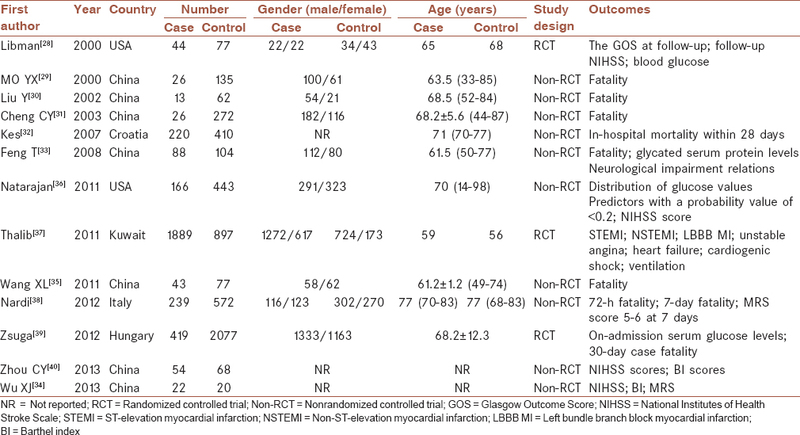 Ischemic stroke in the elderly: an overview of evidence. Nat Rev Neurol 2010;6:256-65. Saposnik G, Fang J, Kapral MK, Tu JV, Mamdani M, Austin P, et al. The iScore predicts effectiveness of thrombolytic therapy for acute ischemic stroke. Stroke 2012;43:1315-22. Heldner MR, Zubler C, Mattle HP, Schroth G, Weck A, Mono ML, et al. National Institutes of Health stroke scale score and vessel occlusion in 2152 patients with acute ischemic stroke. Stroke 2013;44:1153-7.